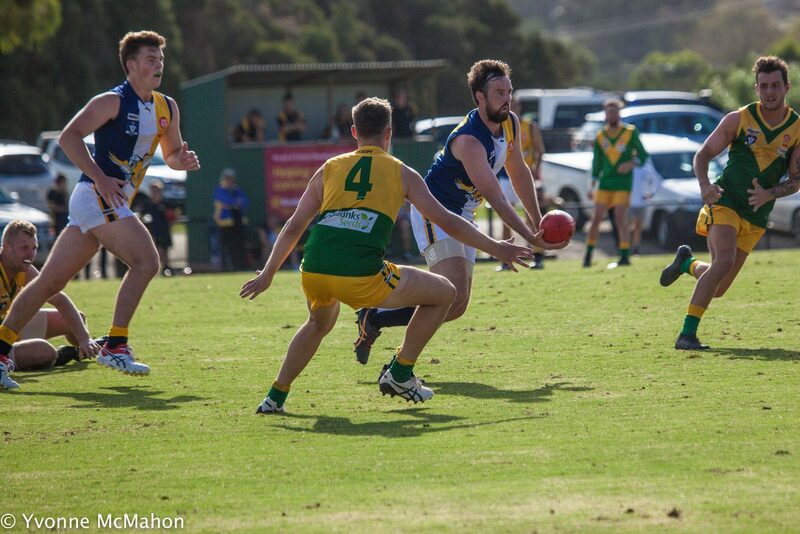 Inverloch Kongwak shook off a persistent Garfield to get its Alex Scott & Staff West Gippsland Football Netball Competition season off to a winning start. The Sea Eagles led at every change, but 10 minutes into the final term it was a one-point game at Garfield Recreation Reserve. The visitors found another gear and surged clear to win 11.14 (80) to 4.16 (40) as both sides wasted their share of chances in front of goal. The Sea Eagles unleashed a host of new faces, with Brendan Iezzi turning plenty of heads with his polished performance, while towering forward Sam Gibbins made an immediate impact with three goals. Dylan Clark and Lewis Rankin were among the other key contributors. Reigning Stars best and fairest Jayden Goumas stood tall for the home side, along with Ned Marsh and Tanner Stanton. In another positive for the Stars, Sam Batson returned to the side following off-season surgery. On the netball courts, Meg Evans tallied 52 goals on debut in Inverloch-Kongwak’s 73-40 win. Evans arrived from Nar Nar Goon in the off-season and wasted no time fitting into the Sea Eagles system under new coach Sue Hawkins. Corinne Merrigan shot well for the home side, finished with 31 of the Stars’ 40 goals. Nar Nar Goon bounced back from a disappointing opening round defeat to overcome rival Koo Wee Rup under lights in round two. The Goon started brightly and never allowed the Demons a foothold in the game, eventually securing the points 8.16 (64) to 6.5 (41). Troy Toussaint, Tyler Payroli and Mat Slattery led from the front for the Goon, who impressed with the speed of their ball movement, while Daniel Galante kicked a goal in his first game in the hoops. Adam McMaster, Cody Miller and Matthew Voss battled hard for the home side. It was a similar story on the netball court, where the Goon’s A Grade outfit proved too strong. Newly acquired goaler Olivia Cope led all comers with 28 goals in the 48-26 victory, including 11 in the second quarter to break the game open. Cope was well-supported by Hollie Keysers (17 goals), while Mariah Bell played something of a lone hand for the Demons with 19. Tooradin Dalmore celebrated the first home game of its new era with a 16.9 (105) to 8.9 (57) win against Dalyston. Julian Suarez starred with two goals in a best-on-ground performance, while Justin Smaluch and Kris Sabbatucci also impressed. Andrew Dean headed a list of six multiple goalkickers, finishing with four. Dalyston unveiled a spate of recruits, with Ryan Silver particularly impressive on debut. Magpies mainstays Kurt Thomas and Blake Carew (four goals) were the other standouts as the visitors opened their season with a competitive showing under new coach Mark Lafferty. Meanwhile on the netball courts, Tooradin Dalmore made a major statement by knocking off the two-time reigning premiers, 53-26. Prior to the game, the Seagulls raised their South East Football Netball League A Grade premiership flag from season 2018. Bunyip registered its first win of the season against Warragul Industrials at Western Park. The Bulldogs struggled to hit the target early, with seven behinds in the opening term, but still led at every change on their way to an 11.13 (79) to 6.3 (39) win. Duncan Proud, Michael Whyte (two goals) and Aaron Paxton caught the eye for the visitors. The Dusties went with an unchanged line up to the side that finished goalless against Garfield in round one and they were able to impact the scoreboard this time around, with Travis Ogden and Shane Ingham recording two goals each. Shane Brewster and Tom Commadeur were best for the home side. On the netball courts, Bunyip’s A Grade side continued its hot start to the season, with a 65-45 win against the Dusties. Jasmin Mackie did the bulk of the damage, adding 50 goals to her opening round tally of 43, with Claire Ablett chipping in with 15. Another six goals from Nathan Gardiner helped Cora Lynn to a comfortable win against Kilcunda Bass. Gardiner took his season tally to 15, while fellow forward Nathan Langley earned the plaudits for his performance in the 14.13 (97) to 5.8 (38) victory. Heath Briggs and Brady White were also prominent for the home side. Riley Cousins, Tom West and Connor Steel (three goals) were standouts for the Panthers, who were buoyed by the return of skipper Daniel Mock, who also featured in the best. The Cobras also came out on top on the netball court, gradually building their lead to win 42-29. Tyla Redwood led all scorers with 30 goals, while Ellen Croft top scored for the Panthers with 15. Phillip Island’s boon recruit Cam Pedersen put a goalless debut behind him with a six-goal showing against Korumburra Bena. Pedersen was a clear standout in the 18.16 (124) to 6.3 (39) win, while premiership star Zak Vernon also returned for the clash under lights at Korumburra Showgrounds. Eli Richards and Mark Griffin also performed well for the Bulldogs. The Giants fought hard in front of their home crowd, with the efforts of captain Ben Fitzpatrick (two goals), recruit Luke Lange and developing tall Bailey Patterson particularly encouraging. It was better news for the Giants on the netball court, where the home side secured the win 59-35.